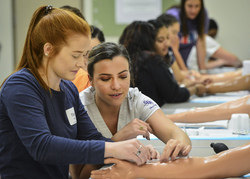 Stephen F. Austin State University senior nursing student Loren Tezanos helped Garrison High School senior Maci Mitchell insert an IV into a mannequin arm during iSTEM, a series of STEM-related events and activities organized by the STEM Research and Learning Center. NACOGDOCHES, Texas - Area middle and high school students spent the fall semester at Stephen F. Austin State University engaging in exploration of science, technology, engineering and math. SFA students and faculty members worked with the students as they completed a series of STEM-related events and activities organized by the STEM Research and Learning Center. "These outreach events provide public, private and home-schooled students the opportunity to come to campus, work with SFA faculty and staff, and experience hands-on activities not available on many school campuses," said Adrienne Aul, STEM Research and Learning Center programs coordinator. To learn more about iSTEM or other STEM Research and Learning Center events, visit stem.sfasu.edu, or call (936) 468-5814.